Trying to reduce the amount of carbs in your diet? Have dietary restrictions or kids that just won't touch their veggies? What you need is the Oster® Electric Spiralizer. It effortlessly turns healthy vegetables into delicious, colorful spirals in seconds so that you can prepare a variety of appetizing dishes. With their sweet, delicious flavor, carrots can be spiralized in a variety of ways. Heat them in a bowl of chicken broth, mushrooms, green onions and poached egg for a delicious ramen-inspired soup, or use them as a replacement for stir-fried noodles and top with a light teriyaki or duck sauce. Spiralized carrots also make a great salad base. Just toss the spirals with finely chopped broccoli, beets, almonds and a light vinaigrette and you've got a fresh and delicious lunch to take to work. Bursting in antioxidants, beets should have a role in any healthy diet. You can spiralize beets in your Oster® Electric Spiralizer to enjoy the uniquely flavored veggie in many different ways. Their distinct flavor pairs well with creamy cheeses, so try a fresh and healthy side dish made with spiralized beets, crumbled gorgonzola cheese and chopped walnuts to accompany grilled chicken. Or, you could make a stunning beet salad with cherry tomatoes, chickpeas, yellow bell peppers and sprigs of fresh herbs. Got a craving for French fries? Stick to your diet by making spiralized sweet potato fries instead. Simply spiralize one or two sweet potatoes, toss with olive oil, sprinkle with sea salt and pepper and bake at 350 degrees for 5-8 minutes until crispy. 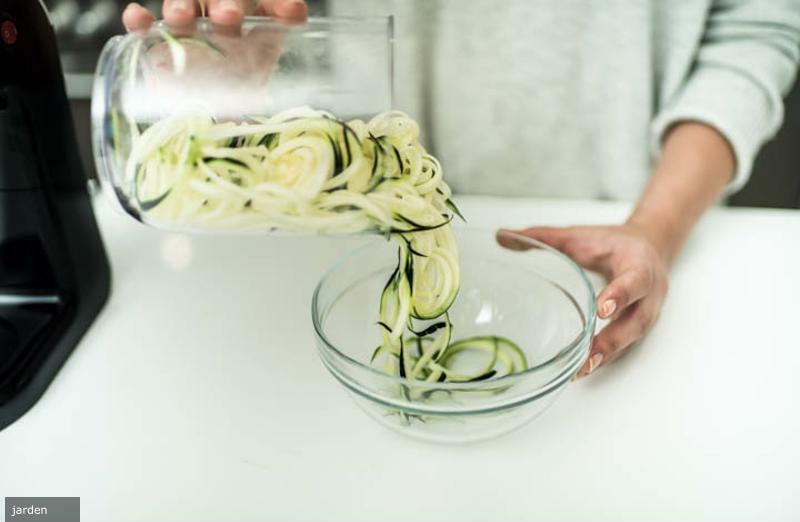 Spiralized zucchini makes a great substitute to traditional pasta noodles, thanks to its firm consistency and mild flavor. It couldn't be easier to create a healthier spaghetti dinner for your family - simply spiralize the zucchini using the Oster® Electric Spiralizer, then warm the "noodles" in a pan and toss with your favorite sauce. Add a little parmesan cheese and voila - you have a delicious dinner that you can feel good about. There are many other meals you can create with zucchini spirals - use them to create more nutritious stir-fries, pasta salad and pad Thai. Sprialized butternut squash is another great alternative for pasta, thanks to the vegetable's rich, sweet flavor, as well as its high antioxidant and vitamin content. The wholesome flavor of the squash lends itself well to pasta dishes made with cheese and cream sauces, like al fredo. For a satisfying dinner that's much healthier than standard pasta fare, toss butternut squash noodles with a light tomato-and-cream sauce, sauteed spinach and shredded mozzarella cheese. Another great way you can use butternut squash spirals is to roast them: Just arrange spirals on a baking sheet, drizzle with olive oil and sprinkle with sea salt and rosemary. Bake at 350 for 5-8 minutes until lightly browned. You can munch on the crispy spirals as a snack or add them to salads.